Each fishing package includes full accommodations. The packages also include full meals at our fully licensed restaurant. 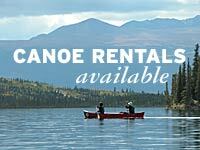 When you book your package you have the option to stay in the Lakeside Cabin or the Log Style Motel. In 1898, the first major physical challenge the stampeders faced on their way to the Klondike goldfields was the daunting Chilkoot Trail, a climb of 1,067 metres (3,500 ft), some of it at a nearly 40 degree angle. Many of them had to make their way up and down the trail more than 20 times as they moved a years worth of supplies to the frozen shores of Lake Bennett. These days, the reward for completing the trail isnt gold, but rather completing a hike through history. Celebrate your accomplishment and stay at Spirit Lake Wilderness Resort before and after the hike.